Book Two of the Stormlight Archive, following The Way of Kings. Note: this review will not contain book spoilers, but will contain spoilers for The Way of Kings. Shallan and Jasnah make their way toward the shattered plains with information they believe crucial to the war efforts there. Kaladin, now freed and working for High Prince Dalinar, struggles with the balance between his duty and his need for vengeance. Dalinar, betrayed by a supposed friend and ally, is still receiving powerful visions that he only barely believes are real. A countdown appears on the walls of the war camp: 62 days until death, destruction, apocalypse. That is a terrible description of this book. It’s really hard to sum up an 1100-page book in a paragraph like that. It’s also really hard to review this kind of book, so instead of attempting a cohesive, flowing single-review, I’m just going to bullet-point this one with my scattered thoughts. I jumped into the 49-hour audio of this book right after finishing my re-listen of The Way of Kings (hereafter TWoK). I didn’t expect it to grab me so completely from the beginning, but it only took five days to finish the audio. By the time I got to the last 150 pages or so, the audio wasn’t fast enough, so I grabbed the physical copy and raced through to the end. I finished the audio the next day, going back over the crazy jumble of events in those last 150 pages. Then I started listening to the book all over again from the beginning. Yes, it is that good. I had some reservations about the first book. 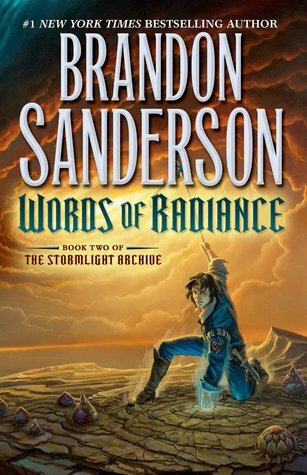 None for Words of Radiance (hereafter WoR) – it was phenomenal. My biggest reservation about TWoK had to do with long periods of the book focused on continuous fighting, and the long drop of Shallan’s storyline. WoR had far more balance to it, which I really appreciated. On that note, it also branched out into viewpoints we hadn’t seen before, particularly into that of the parshendi. One of the things I love most about Sanderson is his ability to set up a world that seems straightforward until he starts shifting the viewpoint around, peeling off layers, showing that everyone’s story has good points and bad points. There are no “bad guys” and “good guys.” Everyone is a different shade of grey. Speaking of death, there was certainly death here. Lots of it. It’s war, after all. Normally, I wouldn’t make comparisons, but I feel one is apt here. There is death, but it is not like Game of Thrones (hereafter GoT) death. None of it felt over the top, or superfluous, or disproportionately too much. Continuing on the compare-to-GoT theme: These are both huge long fantasy series with war and politics and such, but they feel nothing alike to me. When I was reading GoT (before giving it up), it felt like the various plotlines were getting further and further apart, expanding outwards. I worried the same would happen here – especially feeling like Shallan’s story as she crosses the frostlands might end up a lot like Arya’s when she’s making her journey in the third GoT book – but it didn’t. The novel was very tightly woven, with plotlines getting closer together, and new stories introduced whenever too many converged. It was a nice balance. It was fun to see minor characters from the first book come back as slightly less minor characters here. Sometimes it took me awhile to realize who they were. That lent a “small world” feeling without the “amazing coincidence” feeling. It was very hard to read the sections where main characters made really bad decisions. It certainly made for furthering the story-complications (or will, in later books, in the case of late-in-book decisions), but it was still hard to read and made me want to shake certain characters to bring them back to their senses. Which leads me to: These characters feel very real. I get very involved in their world, their mindsets, their viewpoints. This is another area where Sanderson excels. Sometimes, it means I get overly invested in the characters, and honestly I don’t mind that at all. It’s not just the people-characters who are wonderful. Normally, I’m not a fan of sentient other-creatures in books. I have a hard time with familiars and talking pets and that sort of thing. But the spren…they are AWESOME. I especially loved Pattern, Shallan’s spren. I think he made the book so much more than it would have been otherwise. That’s about all I can say without revealing more about the book than I should. As I said before, it was excellent. I can’t wait for the next book, and I’m a bit sad that it won’t come out until 2017!! I’m very thoroughly invested in this series and these characters now, in a way I wasn’t back when I first read TWoK. Performance: The audiobook was read by Kate Reading and Michael Kramer, and they both did an excellent job. I was particularly enthralled with Reading’s handling of Pattern, the buzzing, humming spren bonded to Shallan. At one point while I was listening, I was home with my younger two boys, and I had the audiobook playing at the table while we ate. It was in a section where Pattern is translating a stick’s thoughts (long story), and the stick simply repeats, “I am a stick!” in a very self-satisfied way. The boys had no idea what was going on in the audiobook, but they loved this so much that they kept listening, and grew interested in the story despite not having any backstory. Now, they periodically they start humming or buzzing like Pattern at opportune moments. Ha! This entry was posted in 2016, 2017, Adult, Prose and tagged audio, divinity, dream-invader, favorite, multi-read, reread, speculative. Bookmark the permalink.